Sensational bongo flava artist, Otile Brown and Ethiopian bae not only do philanthropy work together but also promote his music. Nabayet seems quite supportive in the artist´s personal and career life, even his philanthropic acts. 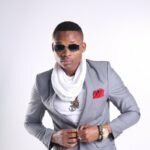 Recently, the 2 were spotted in Naivasha, where Otile was set to stage a live performance at the Bubbles Lounge. He captioned it all under the hashtag: wegotnothingbutlove. On Saturday, the two took a trip, for the event, that was never a disappointment. We all ought to admit though, that: Behind Every Successful Man Is A Woman. Nabayet falls as a good example when it comes to supporting her Kenyan Bae. The post It´s real! Ethiopian bae now accompanies Otile Brown on his music tours appeared first on Ghafla! Kenya.